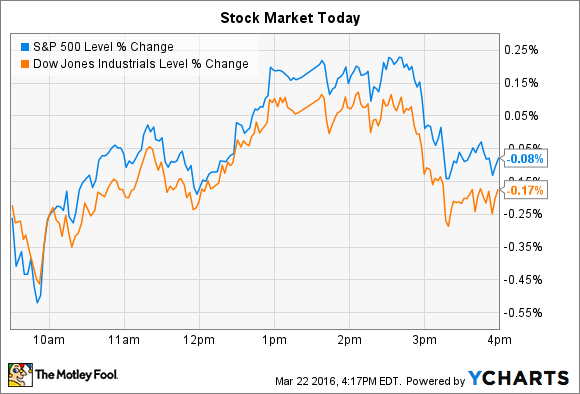 Indexes were relatively flat today, but two stocks made big moves. Staples (NASDAQ:SPLS) and Mattress Firm (NASDAQ:MFRM) were two of the market's biggest movers today, posting dramatic price swings despite the relative calm in the broader indexes. Office supply retailer Staples was the S&P 500's best-performing stock, rising 8% to bring its year-to-date gain to 9% (shares are still down by more than one-third in the last 52 weeks). Today's jump occurred as the company defended its proposed merger with Office Depot (NASDAQ:ODP) in court against a challenge from the Federal Trade Commission, which is aiming to stop the deal on the basis that it would suppress competition and push prices higher for customers. At the start of the hearing, Staples and Office Depot issued a statement doubling down on their combination. "Our commitment to this merger has not changed," they said. "The combined company will be positioned to better serve the changing needs of business customers and compete more effectively against a large and diverse set of competitors." As the hearing progresses, investors are watching for hints that the merger will be approved, and developments that make that seem more likely could move the stock of both companies higher. Wall Street is also listening for how online giant Amazon.com fits into this process. The company is rumored to be interested in acquiring part of Office Depot's business, yet it's being portrayed as formidable rival that will continue to force prices lower, even assuming the merger goes through. "This is big-time competition and a threat," Staples argued in the hearing. Both sides will present their arguments over the next few weeks, and the judge should rule on whether to stop the merger by May. Mattress Firm fell 7% after posting surprisingly weak fiscal fourth-quarter earnings results in which sales improved to $618 million as adjusted earnings rose to $0.53 per share from $0.41 per share a year ago. Consensus estimates, though, were targeting sales of $622 million and profit of $0.56 per share. Management stressed the fact that revenue and profitability both rose, albeit slightly. "We are pleased with our fourth quarter results, which showed approximately 90 basis points of improvement in adjusted EBITDA margin and our tenth consecutive quarter of comparable-store sales growth," CEO Steve Stagner said in a press release. Comps rose by less than 1% in Q4, for a big slowdown from the prior quarter's 4% bounce. Stagner and his team forecast conservative sales and profit gains for the coming fiscal year. Comps, excluding the newly acquired Sleepy's e-commerce business, will be just 1.75% at the midpoint of guidance, or slightly worse than last year's 2.1% uptick. Incorporating Sleepy's operations will also result in significant charges against profits this year, which will apply disproportionately to fiscal Q1, where Mattress Firm now expects to book an adjusted loss. Executives predict "meaningful adjusted earnings growth" in the following quarters, but its overall forecast of $2.55 per share of profit this year still trailed consensus estimates of $2.72 per share by a wide margin.